Beach Junk Stories are stories from my imagination writing about garbage and junk laying around. Sometimes on the beach, the one I visit almost every morning with my dog Teli and her friends, there are large amounts of garbage that wash down from the Rio Ozama. Other times there is just a little bit of trash but usually there is always some trash around. I started seeing interesting toys and pieces of junk and started making stories about them in my head. I shared a few on Facebook and decided I best make a new category on my blog to share my stupid, crazy stories. Today on the beach as I was watching the dogs, Teli and Bertha, playing and enjoying their time at Playita Montecinos I saw a little rubber duckie peaking out of the sand. 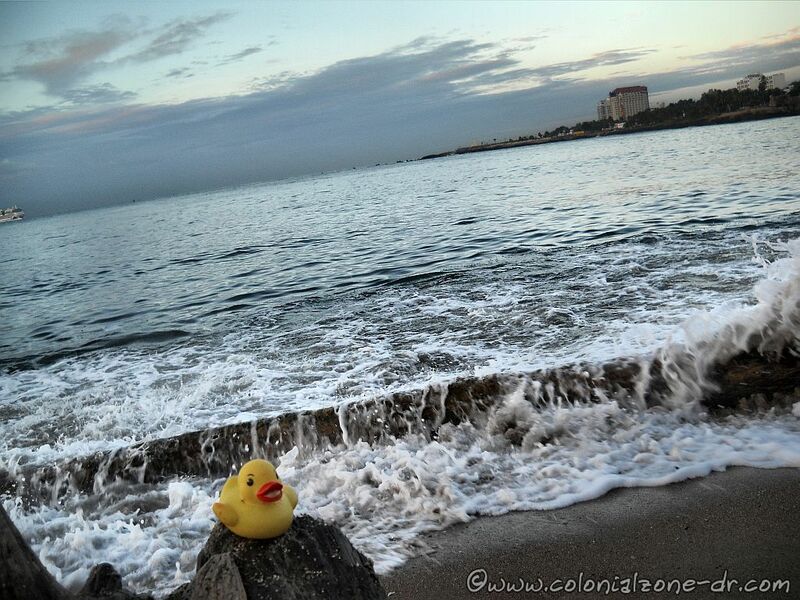 The baby of the Giant Rubber Duck came to Dominican Republic for a little rest and relation. Maybe he came to get away from the crowds while the mom tours the world. The large cruise ship Aida Bella was coming into port. 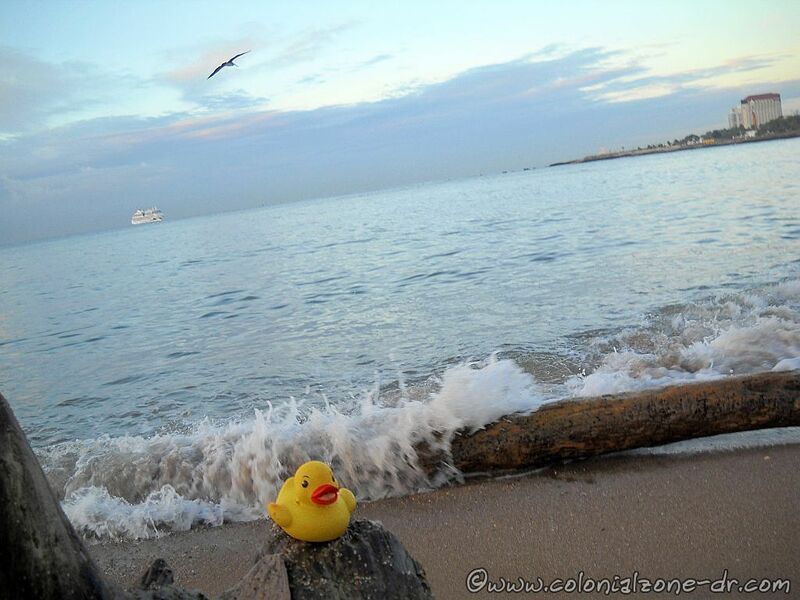 Maybe the duckie hitched a ride on the ship to get to our beach. He was enjoying the surf while resting on a piece of drift wood after the long journey. Even the Pelicans were checking out the little yellow visitor. I bet they were even smiling. Do pelicans smile I wonder? How can anyone or anything that has a mouth and lips not smile when they see a cute rubber duckie? 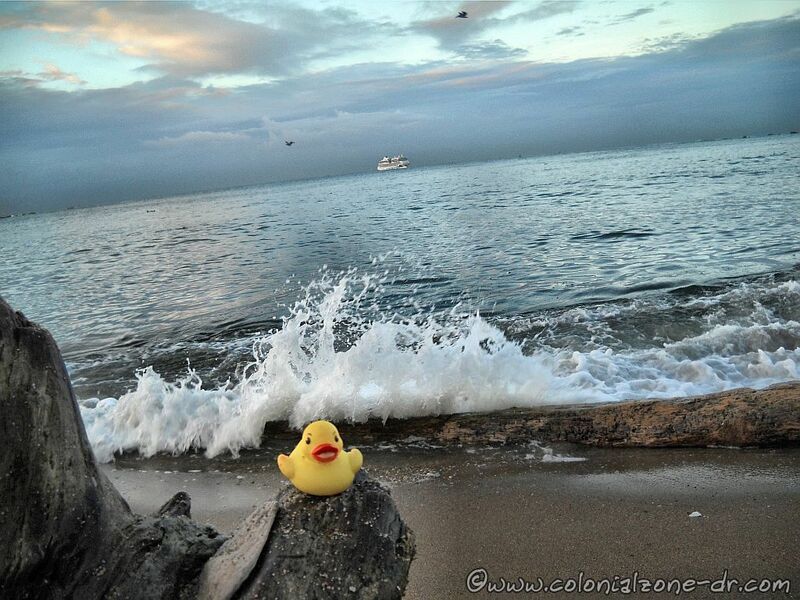 Welcome to Dominican Republic little baby rubber duckie! The Giant Rubber Duck, the babies mom, that has been traveling the world. The creator, Florentijn Hofman, said she made it to spread joy around the world. It is difficult not to smile when you see a giant dock measuring 26×20×32 meters (85×66×105 ft) and weighing over 600 kg (1,300 lb) floating past you. The Ducks first USA visit was in Pittsburgh, my hometown area, with over 1,000,000 people visiting. Beach Junk Stories beach junk stories, duck, giant rubber duck, playita montecino, rubber duckie. permalink.